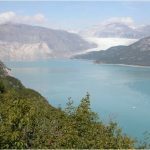 An animation by Robert Rohde which is related to the Global Warming Movie. New tiles will be added at the top and so there will be empty blocks like this at times. It will be easy to see new material, but there is a stylistic downside. An animation from NOAA that can be found on their Trends in Atmospheric Carbon Dioxide page. An global temperature anomaly animation from Berkeley Earth. 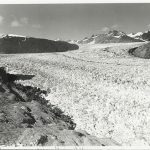 This is from a list of Glacier Image Pairs which are images of glacier taken in the same location but at different times (30-100 year apart). The change is striking. This is part of a grades 4-8 lesson plan from teacher resources at the which is part of the windows to the universe portal with an abundance of information including a number of lesson plans for secondary education. This is a powerful video on wealth inequality (~2102?). For recent data on wealth inequality go to the World Wealth and Income Database. The World Wealth and Income Database will create graphics like this one. 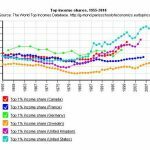 It gives the share of income by the top 1% by for years 1955 to the present for the U.S. (top line), Canada, France, Germany, Sweden, and UK. You can choose the countries, years, and other variables to plot. Data is also available. 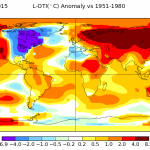 NASA Global Maps Create maps showing average surface temperature for different time periods. Great for discussing the difference between a distribution and a averages. The graph here is for February 2015 and we see that the east coast of the U.S. and into Canada was well below average in temperature, while most every where else was above average and globally the average temperature was 0.86C warmer. This was the same February where Senator Inhofe brought a snowball to the senate floor to "disprove" global warming. 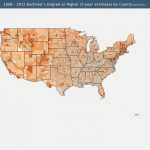 GeoFred ® allows you to create, customize, and share geographical maps of data found in FRED ® (a good source of economic data). Easily access the details and adjust how the data are displayed. (from their about page). The data available is economic related. The graph represent percent of population with a Bachelor's Degree or Higher. Data can also be download in spreadsheets. The EIA U.S. Energy Facts Explained page has a number of informative charts and data sets about U.S. energy consumption. 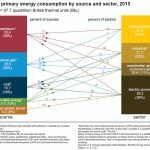 The graph here is U.S. primary energy consumption by source and sector in 2015.